I Do Not Know Where To Begin A Fat Loss Regimen! I am going to share with you a diet and training regimen for fat loss. This will lay out in detail a sample meal plan and training routine. Check it out. Beginning a fat loss regime can be overwhelming. There are an unlimited amount of training philosophies and diet programs to confuse you. What works for someone can have quite the opposite effect on another person. It can be an extremely frustrating process. You almost have to get your Ph.D. in Fat Loss to understand the healthiest and efficient way to look lean and feel energetic! In part one of this article, I will share with you a sample nutrition program that has worked for myself, my clients, friends and family members. If anyone tells you that losing fat and getting a lean physique is easy, then they are full of it! I will tell you right away it takes hard work to change habits. But with the right program for you, motivation, and support, you can reach your goals and stay there. If you have good habits to begin with, then making minor changes should not be challenging. For those who live off fast food and their only hobby is watching television all day long, then this program will be much more difficult. I do not recommend anyone starting this program in full force. Gradually starting into the program will help keep you on track and let your body get use to the proper fuel being utilized. Keep in mind that this program is more based on what you put into your body and is not obsessing on counting calories. 4 oz of lean meat, chicken or poultry. If vegetarian, 3 organic eggs. This program takes out all processed foods and refined sugars. During the day water intake should be at least 8-10 full glasses of water depending on your size. The nutrition programs I design follows an exchange program. You are never supposed to be starving on this program. If you feel hungry you either waited too long to eat or did not eat enough. If you have any questions or need a nutrition program tailored to your lifestyle feel free to contact me at Lauren@SoCalTrainer.com or go to SoCalTrainer.com. Now that you have a sample nutrition program to follow, I will now provide a sample workout program that will go along with your fat-loss program. 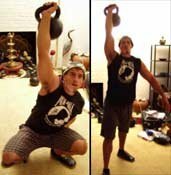 I am a strong advocate on body weight exercises and the use of kettlebells for fat loss. You don't need a fancy $4000 piece of cardio equipment to get the job done. In fact, these exercises will get you the toned look that most people want. (Not just the skinny, flabby look that you get from hours of cardio and no weight training.) And you will also get stronger! All of these exercises provided below can be done with a dumbbell. I strongly encourage the use of kettlebells, however, because of the way the weight is distributed and the use of a handle. I have seen people over and over again get great results with this Russian tool. Planks: Hold for 30 seconds. Try to only take a 30-second break in between the last three exercises. Repeat 3-5 times. 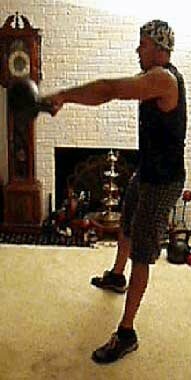 Turkish Get-Ups: 3 on each side. Go through each exercise taking 45-60 seconds rest. Repeat 3 times. Single-Arm Front Squats: 5 times on each side. 30 second rests on the last three exercises, repeat them three times through. Plank: Hold for 30 seconds. Take a 30 second rest after each exercise. Repeat 3 times. Alternating Overhead Press: 5 on each arm. Rest for 1 minute after each exercise. Repeat 3 times. Try and work your way up to resting for only 30 seconds. This program will work every muscle in your body and will help shed the unwanted fat. Stick to this program for 4 weeks. As it gets easier, try and repeat 4-5 times. You never want to train to failure for this program. You want to leave each workout feeling fresh and energetic. 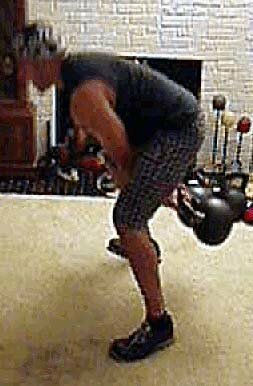 Use a weight that is heavy enough to where you know you would be able to do 2-3 reps more at most without compromising form. Good luck with your fat loss and feel free to email me for questions or comments on how you are doing with your programs! Lauren Brooks is a fitness and strength trainer in San Diego, CA. Lauren earned her B.S. in Kinesiology.